It's only been a week or so since the last one and true-to-form, the SageTV team has released another beta for their Windows, Linux, Mac and Extender HTPC software programs. This one includes a very nice new feature as well as a bunch of improvements and bug fixes. The most important new feature is the 'System Messages' in SageTV. 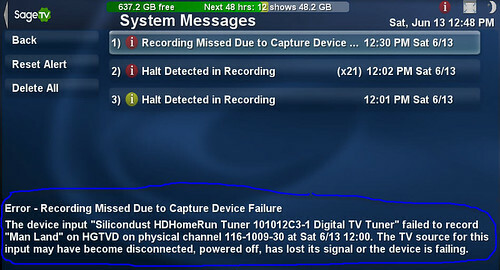 SageTV users now have a new built-in “alert” menu that lists various important messages from the HTPC system. New channels added to lineups – A very welcome addition. When a new channel is added to your TV lineup, it tells you! Channel removed from lineup – just like the one above except this is an alert when a provider removes a channel. Recordings missed due to conflicts – It used to tell you when there was a conflict in advance, but now tells you even after the fact so you know what was missed due to those conflicts. Whenever there is a new message, you’ll see an icon indicator (blue/yellow/red) which indicates if there's new messages and what their severity is. Note this indicator is only supported on the default STV at the moment. Here’s one last screen-shot showing many different messages with varying levels of importance noted by the color. The SystemMessage support also saves all messages to the sagetvmsgs.log file of your computer. and are intended to handle special failure cases, error messages, warnings and status messages that may otherwise be suppressed from the user. 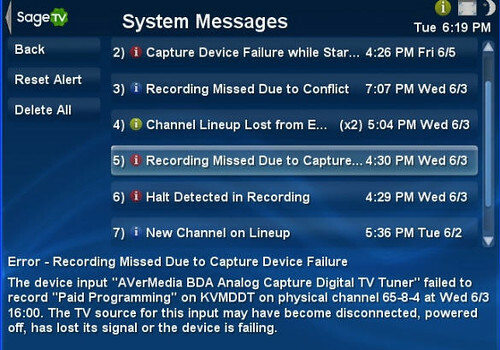 Read more about the new System Alerts Messages in this SageTV forum thread. I’ll be updating to the latest version of SageTweet which has now been updated to optionally show these messages in tweet alerts as well. Added new Remap Channel menu, used when choosing to remap a channel in Channel Setup. Added new Add Channel menu where channels are added by editing data fields instead of filling in a series of dialogs. On Extenders, added fix for RC5 repeat detection logic so it works better with universal remotes (the disable_rc5 setting should no longer be needed) – This is a big improvement for those of us (like myself) using universal remotes that use RC5 protocol. Many additional improvements/updates to the channel setup process – this continues to be a work in progress to improve the easy of setup and use with channel setup. When using the STP-HD200 as a SageTV media extender, it is recommended that SageTV server beta v6.5.17 or newer be used. An RF remote control is a great addition to any Home Theater PC and the ATI Remote Wonder II is a great choice. Unfortunately it isn't sold new any more so you'll have to purchase used (it's available on Amazon used or EBay. Further the setup for most HTPC software programs might take a little extra work. Fortunately David Vielmetter has a nice how-to on setting this remote control for SageTV. "Rather than depending directional infrared signals, it operates using x10 radio frequency signals (~433 Mhz) that can penetrate walls and greater distances than infrared. This makes it much more responsive than than traditional remote controls especially in situations where you need repeating signals. Up until recently I had been using a SnapStream Firefly RF remote control, but after 2 years of use its performance degraded to a virtually unusable state. So I picked up this ATI Remote Wonder II on eBay for $15 and so far it has proved to be a great replacement for my HTPC running SageTV. Here’s how I configured it..."
Over a year ago I used to use Snapstream's Beyond Media HTPC front-end software along with Beyond TV. Back then I had hopes that Beyond Media would evolve into an integrated HTPC software to take BeyondTV to the next level. Unfortunately Snapstream abandoned BeyondMedia and even ceased to sell the software and focus on their Enterprise product and leave BeyondTV as a TV-centric, software-based PVR product. 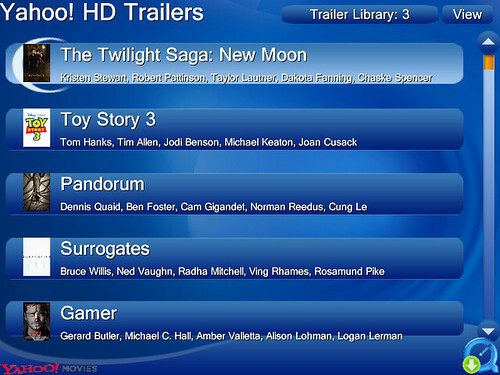 Since then there are still a few users of Beyond Media including one guy who made a new plugin - HD Movie Trailers! Tommy (goes by Tmar89 on the Snapstream Forums) created a plugin for Beyond Media that retrieves the list of HD trailers from Yahoo! 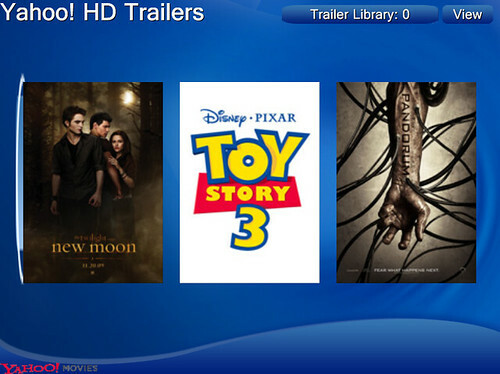 Movies and allows the user to view details and download any of the available trailers in 480p, 720p and/or 1080p. The plugin has two main views: Poster view and Title and Actors view. Also, there is a file library built in to see what's been downloaded and give the user to ability to delete them. There are a few different plugins (and a built-in way) to get Movie Trailers in SageTV, but I'm not entirely pleased with any of them. Here's hoping they get an easy-to install and use way of getting HD movie trailers in SageTV soon. Congrats to Tommy for a job well done on this plugin. This weeks list of premiering summer TV shows includes The Closer, Raising the Bar and Weeds among others. Read on for all of the details. Bridezillas (9pm on WE) - Season 6 starts with Valerie discovering that her wedding venue is in the middle of dangerous wildfires. Discovery Special: Inside Planet Earth (9pm on Discovery - Available in HD) - a Special Presentation profile of the Earth's core and its protective powers. Kendra (10pm on E!) Series premiere. Kendra Wilkinson grabs the spotlight in this reality series on E! Formerly one of the three stars of Girls Next Door, Kendra has since left the Hefner mansion and is now engaged to Eagles wide receiver Hank Baskett. Denise Richards: It's Complicated (10:30pm on E!) Season 2. Really season 2? The only thing complicated here is how this show got renewed. Closer (9pm on TNT- Available in HD) - Season 5 of the closer begins. One of the few bright spots of summer TV. Raising the Bar(10pm on TNT- Available in HD) - Season 2 begins. From the creators of NYPD Blue, Hill Street Blues, and L.A.Law; Raising the Bar is about a group of young lawyer friends and former law school classmates who find themselves on opposing sides of this legal drama on TNT. Kathy Griffin: My Life on the D-List (10pm on Bravo) - New timeslot. Nurse Jackie (10:30pm on Showtime- Available in HD) Series Premiere with the return of Edie Falco to TV. Kings (8pm on NBC- Available in HD) - returns from a long break. Will end forever after these few summer episodes.